WASHINGTON - Reacting sharply to the U.S. expulsion of seven Washington-based Cuban diplomats, the country's top official here said Wednesday the United States had engaged in a "lie of gigantic proportions" in justifying the action. "They know perfectly they are lying like professional Pinocchios," said Dagoberto Rodriguez, head of Cuba's diplomatic mission. He challenged U.S. officials to prove their allegations. On Monday, the Bush administration gave the diplomats 10 days the leave the country for performing "inappropriate and unacceptable activities." Seven Cubans based at the country's United Nations (news - web sites) mission also were expelled, but Rodriguez limited his remarks to his Washington colleagues. A senior administration official said Monday those ordered home from the Cuban mission in Washington were found to have engaged in three types of improper activities: monitoring and surveillance, association with known criminals and the attempted recruitment of spies for Cuba. Rodriguez said the United States is fully aware that the seven engaged in no wrongdoing because American officials monitor Cuban diplomats "physically and electronically 24 hours a day." He said the U.S. action was another step in a plan leading to an eventual U.S. attack on Cuba. "This is a dream of the right-wing extremist groups and terrorists in Miami as well as anti-Cuban members of the U.S. government," Rodriguez said. 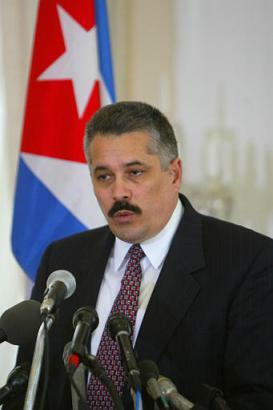 He said Cuba's response to the expulsions will come in due course. Meanwhile, Rep. Jeff Flake, R-Ariz., introduced legislation to lift restrictions on travel by Americans to Cuba. Flake, who led a similar effort last year that fell short, said current U.S. policy is a "total failure." "By flooding the island with Americans bearing American ideals, (Fidel) Castro's stranglehold on the country will be greatly lessened and Cubans will be exposed to the freedoms that they've been denied," Flake said. President Bush (news - web sites) is strongly opposed to any relaxation of the travel restrictions.